During a series of road tours over the past decade or so, I’ve encountered an interesting collection of “fish stories.” Admittedly, many tales are spawned when I’m bored and say to a member of the general public, “I bet you have a fish story.” Other times, a random encounter with a stranger leads to an entertaining anecdote. “What’s that all about?” I asked. You don’t have to be an avid angler to have a connection to fish or fishing. Almost everyone has a story to share although more than one chance encounter has led me to wonder if I had inadvertently opened up a can of worms. What follows are a few favorites. The boy then elaborated how he once hooked himself in the ear. Another bookstore customer pointed to a picture of a black crappie. “Know where you can catch one of those?” he asked. “Not too many places around here,” I replied. The man shared the fish was too big to get in the net so they tried to lift it into the boat “cross-wise.” Unfortunately, the net frame broke, the muskie snapped the line and swam off. Sometimes people come at me two at a time such as the mom and daughter pair who approached with caution. “Is there an angler in the family?” I asked. Her mom gave a blank stare. My best guess was either the daughter was a good liar or mom was senile. Planting a seed on fertile ground isn’t difficult. For example, I asked a man who paused to thumb through one of my books if he fished. “There is always lazy fishing.” I countered. Before long he recounted seeing lamprey swimming in the Clearwater River and large schools of sucker in a nearby creek. One of my favorites fishing stories involved a shifty-eyed man who loitered beside my signing table one rainy afternoon. Somehow the topic of golden trout came up. “Where do you catch them,” I asked. I opened my book to an appendix of salmon and trout from the Columbia River. “I don’t see golden trout in here,” I said, pointing to the list of species. “Just look under golden trout,” he said, turning on his heels and leaving. I left that one alone. “That doesn’t happen very often,” said the first man. “More often than you think,” replied his buddy. Another crowd-attractor is the dried-out carcass of a Chinook salmon that I found nearly 40 years ago. Particularly impressive are its large canine teeth and crooked kype. Many are attracted to its macabre appearance. Others wrinkle up their nose although its odor is benign. I call the mounted salmon my friendship test. If you think it’s cool, you are my friend. “Actually, it’s a dried up Chinook salmon,” I replied. “Doesn’t look like a salmon to me,” he retorted. Not wanting him to walk away mad, I explained how the tail had folded over, general placement and structure of its fins and that teeth of salmon elongate at spawning time to sometimes resemble those of a shark. 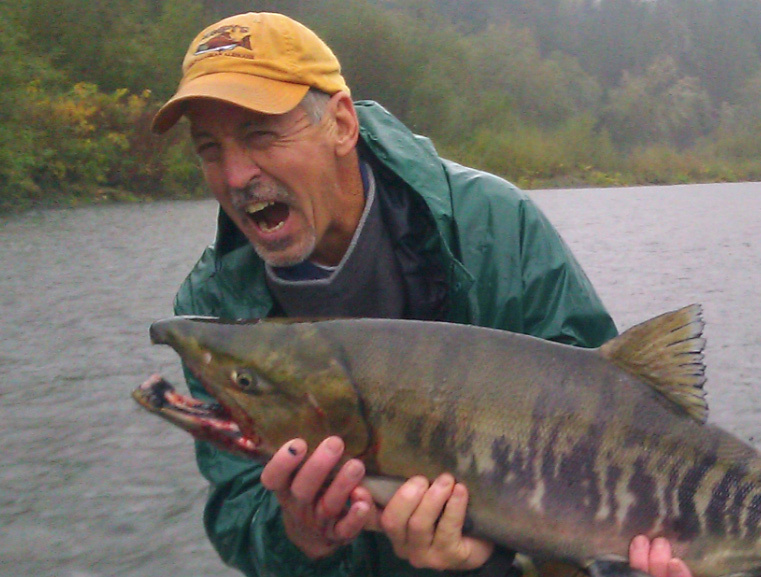 “This fish came from the Hanford Reach of the Columbia River,” I said. “ It’s a dogfish,” he said emphatically, before giving me the stink eye and backing away. I thought to yell after him, “Dogfish live in the ocean. 300 miles downstream from the Hanford Reach.” But I bit my tongue because our chance encounter made for a good story. Dennis Dauble is a quintessential Libra. His main hobbies include fishing, writing, golfing, gardening, and carving pipes and wading staffs from found wood. According to his wife Nancy, (a former elementary school teacher with considerable insight about human behavior) he is A.D.H.D. However, he believes his temperament allows him to efficiently operate a step ahead of nearly everyone else as long as idle thoughts are captured on scraps of paper and pocket journals. As a child, he peaked out after two years of piano lessons and failed four-string banjo, but continues to love all kinds of music, particularly blues guitar.